At the Global 2016 MPSA MPS Awards, presented August 1, at CompTIA’s ChannelCon event, in Hollywood, Florida, one particular recognition went less publicized. 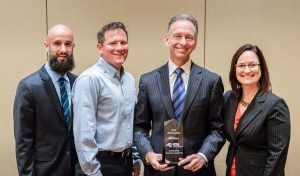 Qualpath President and CEO, and MPSA President, Kevin DeYoung, was named Volunteer of the Year for his tireless work on behalf of the MPSA. DeYoung began volunteering his time to the MPSA seven years ago, soon after it was founded. Although challenging, he insists there is no trick to balancing a busy professional life with volunteer work. As president of the association, DeYoung reports to the MPSA board of directors. He says his work primarily entails partnering with the members of the executive committee and overseeing and supervising the affairs of the association. “I attend as many of our committee meetings as possible with a continual focus on membership value, operations, the go-forward vision of the association and ensuring we are contributing to the overall welfare of the MPS Industry,” he adds. According to GreatAmerica’s Director of Strategic Marketing for Office Equipment Group, Josie Heskje, also a volunteer for the MPSA, DeYoung has been instrumental in helping institute the structure and support that ensures the long-term strength of the MPSA. Asked what he enjoys most about his work for the association, DeYoung cites the fact that it is an all-volunteer organization that is comprised of individuals who are passionate about MPS. Heskje points out that with DeYoung at the helm, the team has accomplished a number of initiatives, including, redefining MPS to include “information” and emphasize business processes in keeping with the evolution of MPS. He has also established a budget committee to ensure MPSA resources are being used for maximum membership value; created membership resources, and along with board member Kim Louden’s leadership, grew committee participation and ensured volunteers are placed in the best areas. For his part, DeYoung is pleased with the impact the organization has made in helping communicate the value of MPS to the industry. He cites the educational webinars and whitepapers as being particularly beneficial. DeYoung says that the best part of his association with the MPSA is the enjoyment of learning and the collaboration that occurs when working on an initiative. “At the root of it all is pushing to do MPS correctly which will further the solution benefits to both end-user and provider,” he adds.